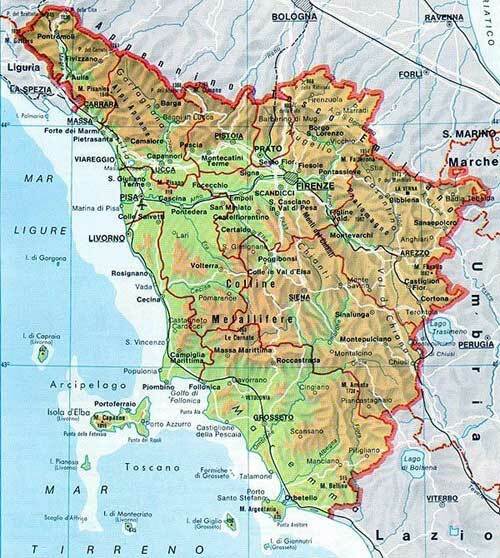 Territory: The region stretches over the slopes of the Apennines, in front of the Tyrrhenian Sea. 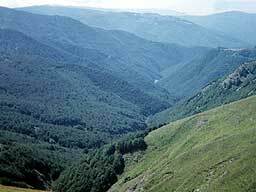 The Tuscan landscape is mainly mountainous and hilly, with a flat area beside the sea (the Maremma). The coastline presents different aspects, offering both long sandy expanses and headlands. In front of the coast there are the small enchanting islands of the Tuscan archipelago. Cities: Florence is the capital of Tuscany. Other important cities are Siena, Pisa, Arezzo, Pistoia, Lucca, Livorno, Grosseto, Massa Carrara. Art: Tuscany is unrivaled as a cradle of all-time art. One can find examples of every age and style: from the Etruscan civilization (Fiesole, Chiusi, Volterra, Populonia) to Roman monuments and ruins; from the Romanesque architecture to the impressive Gothic cathedrals, to the exceptional artistic explosion of the Renaissance. Museums: Florence has preserved its masterpieces and great works of architecture over the centuries. The most important collection of paintings in the world is offered by the Uffizi Gallery; visitors can enter the very interesting Designs and Print Room; the collection of self-portraits. Great paintings can be seen in the Gallery of Palazzo Pitti, with Tiziano�s and Raffaello�s masterpieces. Florence also has the Museum of the Costume and the Museum of the Carriages; the beautiful Italian gardens can be admired in the Giardino di Boboli. In the Museum of the Opera del Duomo the famous "Piet�" by Michelangelo can be admired. Then, there are the Museum of the Bargello, St. Mark�s Museum, the Academy Gallery and the Ethnologic Museum Stibbert. Pisa, an ancient Roman naval base and maritime republic, has the Museum of the Sinopie, which holds the preparatory drawings for the frescoes, and the National Museum of St. Matteo. Siena is a well-preserved medieval city; here there are the Civic Museum, which houses the Histories of Alexander III, the Museum of the Opera Metropolitana and the Pinacoteca Nazionale, with Senese painting. Tradition and art are strong everywhere: in Arezzo the Gallery and the Medieval and Modern Museum can be visited. To be visited: In addition to art, Tuscany offers outstanding nature sceneries, such as the National Park of the Argentario and the Isola of Elba. In Siena there is the beautiful Piazza del Campo. In Florence there are the fifteenth-century shops on the Ponte Vecchio. Pisa has the Campo dei Miracoli, with the famous Leaning Tower.